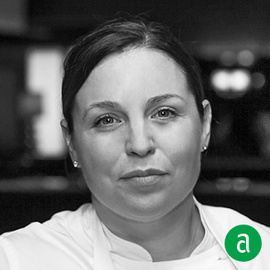 Melissa Rodriguez, Executive Chef of Del Posto, in New York, shares her career timeline and advice for up-and-coming talent. Setting realistic goals for yourself at work is really important. You should be able to see the things that you want to be able to do at a restaurant. At Oceana it was being fish roast, at Daniel it was being meat roast and making terrine, here at Del Posto, it’s cooking pasta. If you can set yourself up to achieve what you want, then you’ll get there eventually. Keep your hands busy, and your eyes and ears open. If you don’t have the proper work ethic, then you’ll never be able to see all that you need around you and participate. Take your work seriously. Take care of yourself. You only get one body, and this job is hard on it. That includes mental health care too! It’s important that you talk to the people you work with. You need to be expressive, and make sure the people you work with know that you want to succeed and grow in your role. Share your intentions with your managers and colleagues, and more importantly, have intentions. You must also be patient. Get to know the people you work with. You see them more often than your loved ones. Say hello, say goodnight. Try to have a professional relationship that will grow, because you will most likely see the people you work with again. Some of the people I’ve worked with in the past are my best friends. This is a very small world.